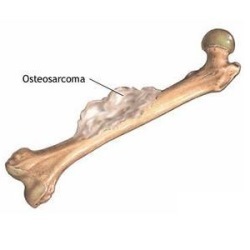 [toc]Bone tumors can be either benign or malignant (cancerous) form. As bone tumor develops and grows, many symptoms can occur but pain remains the most frequent amongst all. Brain tumor can occur in any of the bones, but usually observed in long bones of legs and arms. Bone pain that is originated by brain tumor is many times mistaken as growing pains in children and teenagers and arthritis pain in adults. Initially the pain occurs at night or during activity. The symptoms of bone tumor can last from weeks to months to years, depending upon the growth of tumor. In Ewing sarcoma form of bone tumor, the bone pain gets worse instantly. It is the most common symptom of bone tumor that becomes noticeable as the tumor grows. It begins as tender feeling in the affected bone and gradually proceeds towards a consistent ache that gets worse at night and while performing activities with the suffered bone. A deep and dull pain can be felt at the bone region like arms, ribs, pelvis, back or legs. The pain may remain persistent for weeks, months or years depending on the kind of tumor, before one finally seeks a medical attention. Individuals with bone tumour can also experience redness, swelling and detect a noticeable lump (mass of cells) over the bones or in tissues surrounding the tumour bone. If bone is adjacent to a joint, then swelling may cause difficulty of joint movements and even the normal movements will be accompanied by pain. The lump is more commonly observed in fibro sarcoma or MFH but is a possibility with other forms of bone tumors too. Eventually the bone gets weakened by tumour and can lead to breakage with no or little trauma. Bone tumour may result in fracture on minor fall, injury or even on performing a little bit acts like standing on affected bone for a while. The break usually happens in those regions of bone that have undergone a prolonged period of pain or swelling. This is the possibility with both malignant and benign forms of tumors. Benign bone tumors can spread locally and may weaken the adjacent bone. In specific situation, Bone tumour may compress the nearby nerves causing tingling, pain and numbness in the extremities. In case, the surrounding blood vessels get compressed, the normal blood flow to the extremities gets hindered, causing inactivity of the limbs. People with bone tumors may also experience unexplained weight loss, sweating (commonly at night) and fatigue accompanied by bone pain. There can also be difficulties in breathing, high temperature of 38 C or more and frequent chills, but these may happen with low probability. These uncommon symptoms can be observed after the bone tumour has spread to other regions and tissues of the body. Symptoms of persistent bone pain, lasting for more than 3 days should be treated as a serious concern, especially in children and should not be mistaken for growth development pains. With proper medical diagnosis, early treatment can be employed in case, the bone pain results out to be due to bone tumor.